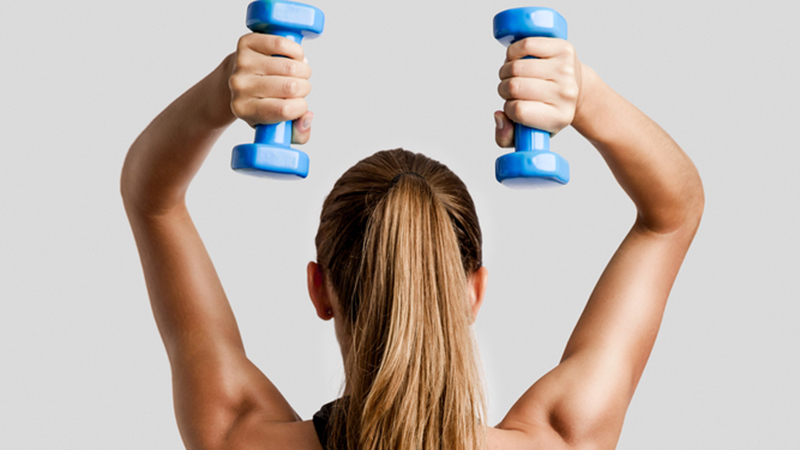 If toned arms are what your after, consider adding dumbbells into your gym repertoire. Dumbbells are one of the most versatile and easy-to-use pieces of gym equipment around (you can even do this work out at home). You’ll need 10 to 15 pound dumbbells, depending on your current fitness level, as well as a mat. Do the required sets of exercises with short rest periods (20 seconds) in-between them for maximum efficiency. As you get stronger and the circuit gets easier for you, you’ll need to do more reps and/or slightly increase the weight of the dumbbells you use. Remember that for toned arms you should be able to do about 18 reps with your choice dumbbell weight. This workout will leave you toned, taut triceps. Stand with your feet shoulder-width apart, holding a dumbbell each hand. Lift the weights behind your your head. Bend your elbows to raise and and lower the weights behind your shoulder area. Aim for 20 reps at a fast pace. The overhead press is an efficient means of ridding your arms of jiggle. Start standing with your feet shoulder-width apart, arms holding a pair of dumbbells and bent at 90-degree angles to the side of the body (dumbbells should be raised to about the side of your ears). 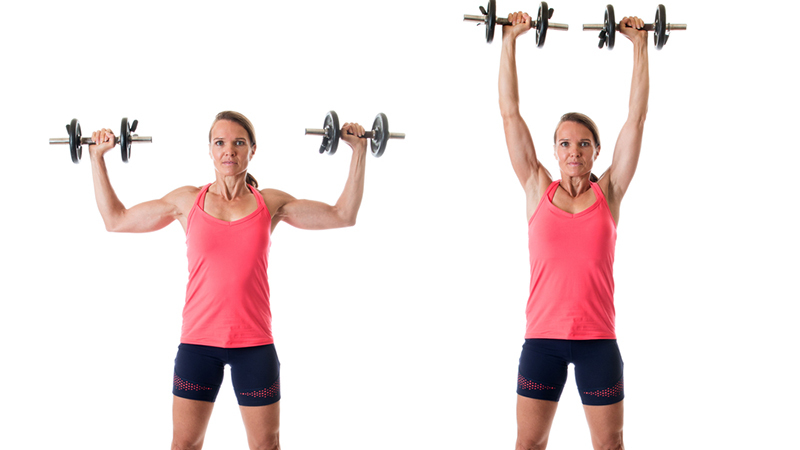 Holding your core tight, push arms and dumbbells up and straight overhead. Lower the weight back to the starting position for one rep. Aim for 20 reps in quick succession. Start by holding a dumbbell in each hand, with your palms facing in towards your body. Bend your elbows and curl the dumbbells up toward your shoulders. Then, rotate the dumbbells so that they are facing out and push them up and straight up over your head. Return them to 90 degrees, rotate and extend down. That’s one rep. Complete the workout by pressing the dumbbells up forward straight out in front of your shoulders. Aim for 20 reps.
As its name suggests, this compound exercise is a combination of a rear fly and press back. Start standing on your heels, feet crossed and shoulder-width apart, setting your chest on your knees so you’re bending forward slightly at a 45-degree angle. Hold a pair of dumbbells in your arms and let the arms extend downward in front of your body. Raise your arms up, hold for two seconds, and lower back down. This is one rep. Aim for 20 reps. The starting position should be a modified pushup position with both knees flared outside the body and both feet touching together. Keeping your elbows tucked in and your core tight, slowly lower your torso to the ground. Stopping about two inches short, quickly press back up to the starting position. Aim for 20 reps and be sure to maintain proper form.